There are 8 different workitems (W_-activities) in the Application log. I assume that each of them is associated with some manual work. However, that probably depends on their specific lifecycle transition. 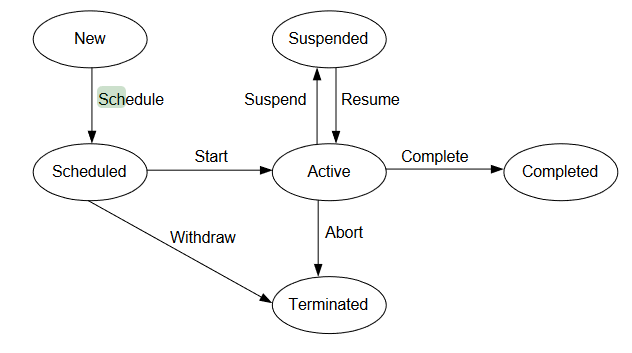 There are 7 different lifecycle transisitions of W_-activities (suspend, complete, start, resume, schedule, ate_abort, withdraw). Which of these involve some "real" manual work, and which ones are just system events with no subsequent manual activities? I could imagine that "suspend", "schedule", etc. fall into the category of pure system events, but I'm not sure. Can you give us a more comprehensive explanation on which lifecycle transitions involve manual work? Mohammadreza, thanks for that link and image - very helpful. Do definitions of each of the terms exist? Not absolutely necessary, I just like it to click into place in the old noggin. Therefore, you could say 'touch time' is the time it was siting in the 'active' status? Apologies for double post... I noticed the event log is slightly different to the image. It would be helpful to see a map of the event log and how each item flows. I downloaded the application data set and imported it in Disco. But I can find only two lifecycle transitions (start and complete) for W_-activities. why is that? what is the problem?